Shopping for Cars Film Cells? This amazing Series 1 quad film cell features prints and actual strips of film from the Disney/Pixar Cars 2 movie. Limited edition of 2,500 pieces, it measures 20-inches tall x 11-inches wide. 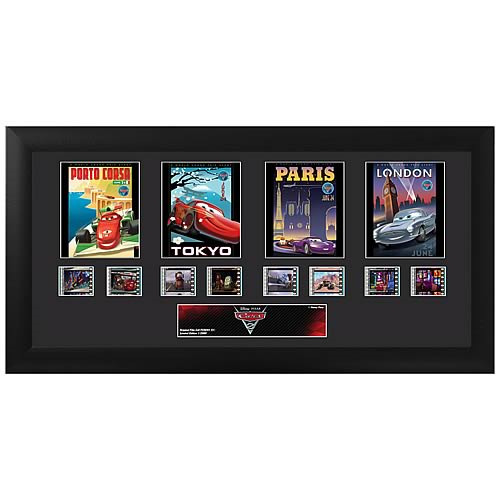 Perfect for displaying in your home or at the office, all the elements are framed in black wood and include a certificate of authenticity. Order yours today! In Cars 2, Mater and Lightning McQueen take their friendship to new places when they head overseas to compete in the first-ever World Grand Prix, a multinational exposition race created to determine the world's fastest car. Caught between assisting Lightning McQueen in the high-profile international race and a top-secret spy mission, Mater's adventure leads him into an explosive chase through the streets of Europe, trailed by his friends and watched by the whole world. Please note that the actual cell of film may vary from piece to piece, as they are hand-selected from reels of film.